On the Horizon Batik Quilt - SOLD OUT! 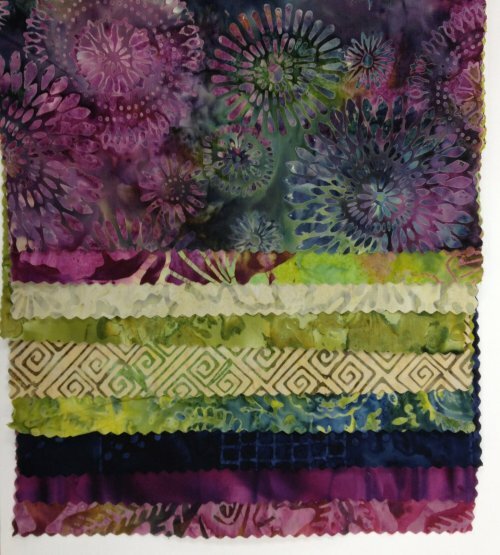 Flexible BOM Programs > On the Horizon Batik Quilt - SOLD OUT! On the Horizon - Flexible Block-of-the-Month (BOM) Quilt! This can either be a large queen or a king size quilt! Timeless Treasures Tonga Gypsy Batik Collection - WOW! This is a case where the image of the quilt does not do the fabric justice! These beautiful fabrics are from the Timeless Treasures Tonga Gypsy collection. 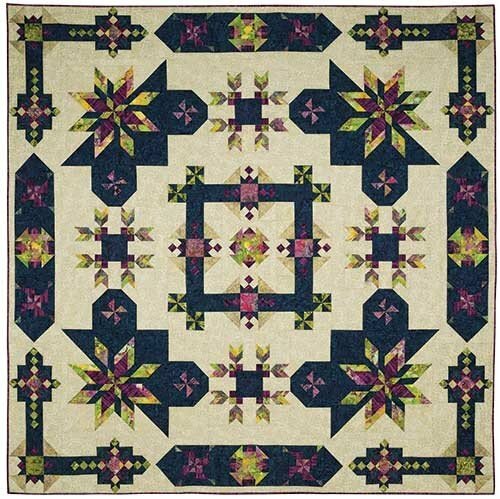 Unique Block Design = A Stunning Quilt! Take a look at this design. Isn't it nice to have such unusual blocks? This will be fun to make! Note that the computer generated block images look more tan than the actual fabric in the photo below. Timeless Treasures ran out of the original blue batik used in this project. 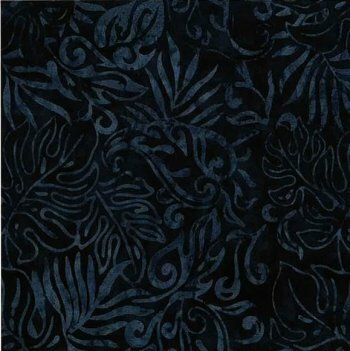 They recommended that we use this blue batik instead. It's really pretty! What Does Flexible Block-of-the-Month Mean? You tell us how many blocks you want and how often you want them! We cut all kits ahead, so you are guaranteed that your kits will be available when you want them. We can ship in multiples - you save money on shipping and handling. If you prefer a complete kit - no worries! Because we cut all kits in advance, we have complete kits available at the start of the program. We have found that we can generally ship three months of blocks for about the same price as one month, so we recommend multiple block shipments. You can have 2 or 3 blocks ship monthly, every other month, or every three months. Or take six at a time and call us when you are ready for more. Tell us what works for YOU! We have many customers Internationally and we do our best to package your kits to minimize shipping costs. Generally, we can get two-four kits in a flat-rate envelope...it depends on how much fabric is in each kit. The first shipment will contain your Boo-Boo Bundle and any rulers you order. We recommend combining the last few blocks and backing in one large box, as each of those will be too large to fit into a flat rate envelope. * Quilt size: 108" x 108"
* 9 Kits - you choose anywhere from 1 Block per month to a Complete Kit! * Flexibility in How the Program Works - designed around you! * Full-color Fabric Guide - makes it easy to identify your fabrics! * Fabric Essentials Exclusive cutting diagrams - priceless! * All fabrics for the top and binding! 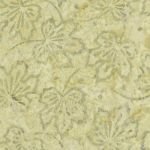 * 10 Yards Batik Backing cut into three equal pieces (3 1/3 yards each) to make it easier to work with! * Boo-Boo Bundle - 1/2 Yd extra Background of the cream and navy fabrics and Fat 8ths of all the others! * Bonus - Free Gift - we'll let it be a surprise! Note: We cut all kits in advance - this means that your fabrics will be from the same shipment. When you sign up for our BOM programs, we put all your kits in a bag with your name on it. We cut your backing in advance as well. You are guaranteed to get all your kits! Less risk for you and no worries! We include a beautiful coordinating 45" wide backing with your program. Please note that the pattern calls for only 9 1/2 yards backing. That would only be 3 yards 6" (114") per strip for a 108" quilt. That is only 3" extra all the way around and we feel is NOT enough! We are including 10 yards of backing cut into three equal strips of 3 yds 12" each (120"). This gives an extra 6" all the way around. Please give us your 1st, 2nd and 3rd choices as fabric is limited. 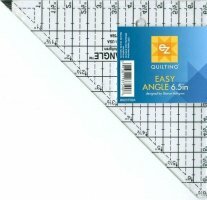 What are the Fabric Essentials Exclusive Cutting Diagrams? We create cutting diagrams for the fabric pieces in all kits. With these visual guides, you don't have to figure out how to lay out the pieces to fit on the fabric, greatly simplifying the cutting process! We have all experienced what can happen if you start cutting without first figuring out how all the pieces will fit - they may not. Oops! With our cutting diagrams you are less likely to make mistakes and your cutting time is drastically reduced! Even if you get distracted and goof up, you'll have our Boo-Boo Bundle as a backup so you can keep going! Bottom Line: Fewer mistakes and more quilting fun! We provide everything you'll need to be successful! Do I need any special rulers for this project? 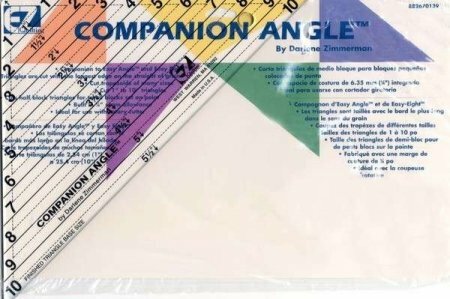 The Easy AngleTM and Companion Angle TM rulers are required, and can be ordered below.